10 things to do in Abu Dhabi that you mustn't miss out on! Abu Dhabi, in my opinion, is a must visit destination when you think of United Arab Emirates. Of the seven Emirati, Dubai is the most popular destination for tourists, and here are a bunch of things to do in Dubai. Abu Dhabi has not developed at the same pace as Dubai but surely offers a different experience. This means you need to make sure you stay in that city for a longer duration and explore more. Many including me plan for a day trip to Abu Dhabi while we realise the hard way that Abu Dhabi offers more than what we read on most travel itineraries. We only had a day in this beautiful city and were left wanting for more. a. Ferrari World – Largest space structure ever built! You have Formula Rossa, the fastest rollercoaster in the world that takes you from 0-240 in under 5 seconds. Trust me, this will be the ride of your life. There are two more roller coaster rides if one doesn’t serve your adrenaline tummy. That’s just for starters. This place is beyond amazing, and one need not be a Ferrari or an automobile fan to enjoy here. Each and everyone who enters this world has something to experience and go WOW. Kart your Ferrari F1 cars in the miniature Yas Marina Circuit, go back to Italia of 1960’s on the simulated rides and take that walk in the magical land of Italy. My dear fellow Indians and people who love Indian food – there was Chai and Chaat corners inside the Ferrari World. We dined at Mamma Rosella, and it was YUMM. Kids of all ages will have a blast so make sure you, parents, have more energy than them. We went during the last week of December, and there was snowfall (artificial obviously), Santa posing in his cart and what not. The place made my husband, and I feel like an eight-year-olds. There is so much to do, and you will need a day to enjoy everything in there. We purchased Bronze tickets at first but later upgraded to Silver as we did not have much time on our hands. Yas Marina Circuit takes you to the world of Formula 1 drivers and their teams. This is one of the best circuits and can be experienced through a guided tour. Sink in the sights of the pits, the hi-tech facilities, the key places like the North Grandstand and live the life of an F1 racer, at least for a short while. Click here to know more. The Yas Mall, on Yas Island, is one the biggest malls in Abu Dhabi. It has a 20 screen theatre which sounds like fun! Also, IKEA is right next to it! Yas Waterworld needs a full day and has rides which can be found nowhere else in the world. Click here to know more on the entry fees. The Yas Beach is a recent initiative which offers a calm and laid back experience. All leisure activities can be experienced here. Please note that if you do not stay in the Yas properties, your entry to this beach is charged. This is one of the most beautiful mosques I have ever visited. So white, so peaceful and amazing in architecture and interiors. We went in the morning although I would have loved to go during sunset. Many did mention that the beauty of this place multiplies many folds with the lights glowing all around. Follow the dress code, and they offer burkas at the entrance in case you aren’t covered properly (shorts, sleeveless clothing aren’t allowed). Entry is free. This beach has been awarded the internationally renowned eco-label for beaches that guarantees clean and safe bathing water. With lots of space to park the vehicles, cycle, walk and many restos to enjoy your time, this is a must visit location when in Abu Dhabi. This 7-star property is obviously one of the most expensive hotels in the world. Don’t be upset if this luxurious hotel is a little out of your reach. They have a guided tour for outsiders which requires you to book in advance. Click here for more info on how to make sure you visit this palace. Book a room at this beautiful property! All of us have heard about ‘At the Top’ in Dubai’s Burj Khalifa. Abu Dhabi is not going to let you go without the city offering its beautiful skyline too. You get these magnificent views from the 74th floor of the Etihad Towers – Tower 2. Check Groupon for discounts. The story goes that the ruling members of Abu Dhabi were originally settled around this oasis. Only for adventure and thrill seeking travellers, this place offers camps and dune bashing. You will not find many people here, so this will offer that peace you have always wanted. They say it is quite a drive from Abu Dhabi, about 250 km, but it is definitely worth it thanks to the experience it offers. I have bookmarked this link to explore the area if I get to go back to Abu Dhabi. 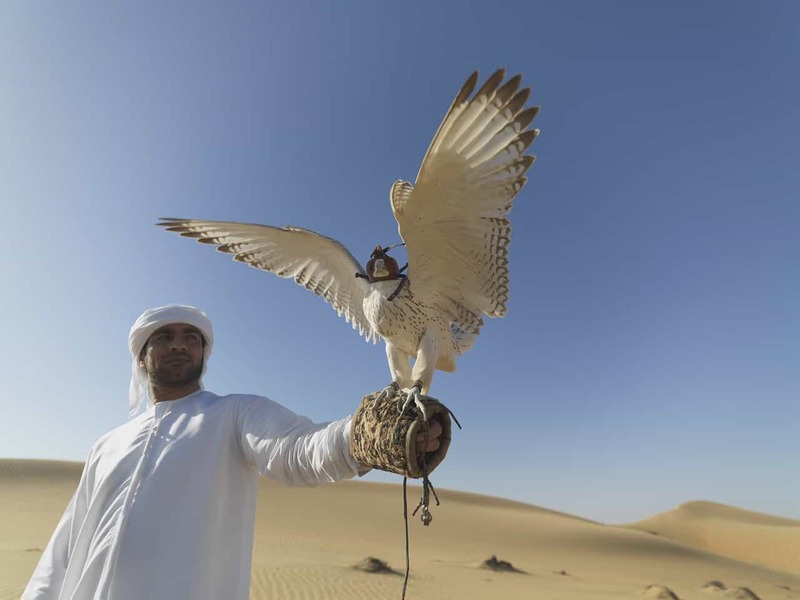 Falcons have played a huge part in UAE’s history and is the national bird of UAE. Abu Dhabi has a hospital exclusively for falcons. This hospital was recently opened for the benefit of the public, to know more on falcons and falconry. You get to see how the feathers of the falcons are repaired – which is more like its pedicure session, and get to know more on why falcons are so important to the Arabs. Sounds interesting, doesn’t it? You also get to pose with falcons and carry the memory for a lifetime. This is the oldest man-made structure in Abu Dhabi. What makes it even more famous is the fact that it is home to the ruling family Al Nahyan. This is a historic fort which was once a light tower and now is the host to the annual Emirati Heritage Festival. Check out the Google Street View. There is something for everyone who wants to visit the Zoo as well. From animals of all sizes and ages, experience the Emirates Zoo in Abu Dhabi where you can feed elephants or say hello to the white lions. Abu Dhabi promotes Women’s Handicraft which showcases their local arts and crafts. People who enjoy applying henna on your hands, this is the place to go to other than exploring options to buy the local dress, oils, perfumes, souvenirs etc. South India: Did you know this about Pondicherry? The Grand Mosque in the evening looks so so beautiful with all the lights which we missed 🙁 I am hoping to go back some day just to visit the Grand Mosque in the evening. Abu Dhabi seems the kind of city where you could wander on the streets for hours, soaking the culture and the architecture. I hope I will get to visit Abu Dhabi one day. I’ve heard and read so many wonderful things about Abu Dhabi. I like the variety in your list. If you’re short on time, then you can just pick and choose your favorites. For me, I’d have to go on the observation deck and see the falcon hospital! Haven’t been to UAE yet but you gave me plenty of reason why I should add it to my bucket list. The White Mosque is absolutely amazing, so impeccable and peaceful with its amazing architecture and details. I agree with you, you cannot leave the city without seeing it from above and I can imagine how the view is from the 74th floor. Having a hospital for falcons is definitely cool. Thanks for putting together this list. That’s sweet of you Oana 🙂 Like you have mentioned, there is something so serene and pure about the Grand Mosque. As many of travellers Ive started with Dubai and as for today I haven’t visited Abu Dhabi yet! But I am seeing so many photos of The Grand Mosque that.I am really tempted to book my flight as soon as possible! It seems like its such a wonderful city with so many things to do! The emirates Palace looks stunning as well! Very nice! I’m interested in the Falcon Hospital considering that we love wildlife. 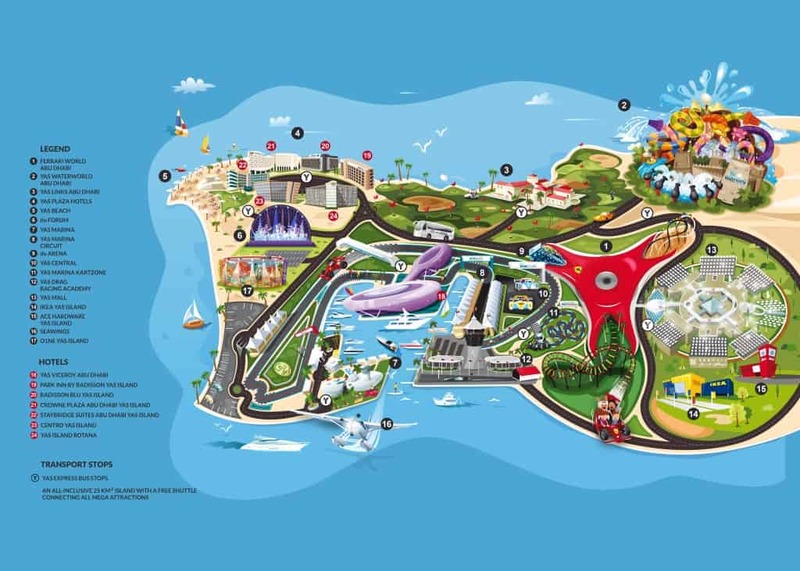 If we are able to bring our daughter, she would definitely enjoy Yas Island. Abu Dhabi, the capital of the UAE is really an exciting place to visit. We were in Sharjah last month but could not make it to Abu Dhabi as we went to Dubai. Hope to visit Abu Dhabi next time around. The Ferrari world is something that interests us and the Formula Rossa sounds like a real adrenaline pushing roller coaster ride. Of course not to forget the Grand Mosque which looks so exquisite. Mosques are indeed the crowning glory of the UAE, absolutely loved the Al Noor Mosque in Sharjah and the Grand Mosque looks beautiful too. We have been to Dubai but Abu Dhabi is still on our list. 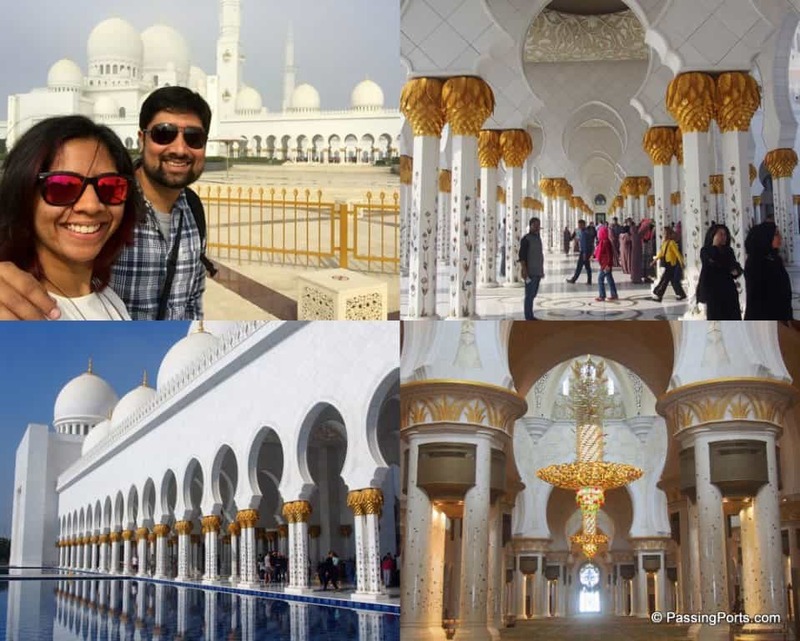 We have been awestruck by the gorgeous THE Grand Mosque and really want to visit. Hope we can go to Abu Dhabi this year. Lovely blog. Abu Dhabi is so high on my list. I want to visit the Emirate Palace, Ferarri World and the Grand Mosque. The Falcon hospital looks cool too . You have covered everything possible on your list. Bookmarking it for our trip.